Schalke vs Dortmund saw the Königsblauen power past their neighbours. Peter Stöger’s Schwarzgelben had no response to their hosts fast flowing football, on an afternoon that cemented a shift in the balance of power in the Ruhr region. The second Revierderby of the season was highly anticipated after ‘part one’ some five months earlier. Back in November it was the Schwarzgelben who threw away a four-nil halftime lead, allowing their neighbours back into a game that was all but past them at the break. Both coaches named their strongest available sides and the action was instantaneous. 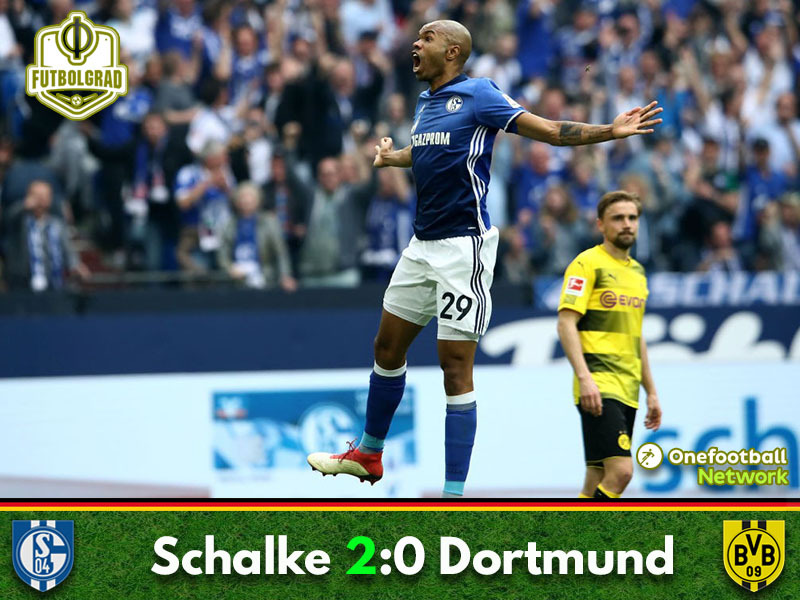 Dortmund’s attack forced an early corner as the hosts looked less than convincing in the opening minutes – Ralph Fährmann put under pressure twice by a succession of sloppy back passes, Schalke rode their luck and just about escaped with the score intact. Alessandro Schöpf was the first to test Roman Bürki’s reactions in the visiting goal, his rocket on six minutes looked destined for the bottom corner until the Swiss goalkeeper turned it around the post – it was a brilliant save. 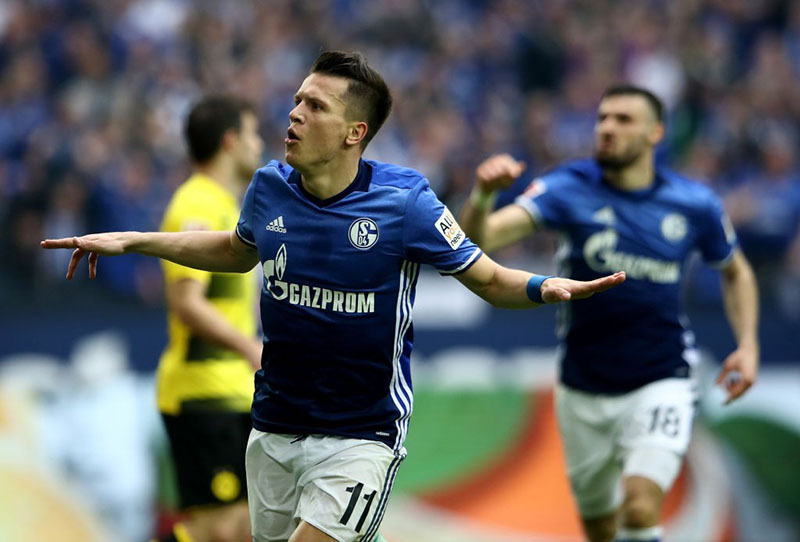 The fixture had come to life and the Veltins Arena with it, the hosts started to take control -Benjamin Stambouli and Yevhen Konoplyanka began to put the Dortmund back-line under tremendous pressure, Schalke just unable to find the final ball to punish their visitors. Marco Reus almost gave Dortmund the lead against the run of play midway through the half, his well taken free-kick met by an equally impressive save from Fährmann. As the first half went into added time Konoplyanka cut in from the left flank and fired in a shot that had Bürki beaten, unfortunately for the Ukrainain it also sailed wide of the upright. After a largely anonymous 45 minutes for the visitors, Peter Stöger decided upon a half time shake up – André Schürrle replaced Maximilian Philipp as the Dortmund coach looked for more creative inspiration. Schalke continued to press and harass – Konoplyanka looked to have beaten Sokratis with a wonderful surge, but the referee penalised the midfielder for a foul. It was a harsh call, especially as the Ukraine international was through on goal. As seen throughout this season, Dortmund are prone to being architects of their own downfall and this became the case once again. Marcel Schmelzer inexplicably gave the ball away 25 yards from goal and Schalke pounced. Daniel Caligiuri found Konoplaynka in acres of space, the Ukrainian punished Dortmund’s lack of concentration with a thunderous shot – Schalke were in front and it was fully deserved. Christian Pulisic theatrically threw himself to the floor inside the Königsblau box, referee Aytekin was unimpressed and waved the protest away. Dortmund had half chances to equalise, first with Reus and then with Pulisic – neither player able to really test Fährmann in the Schalke goal. With 15 minutes remaining Dortmund finally began to test Schalke, the hosts opting to drop deep allowed the vistors the time and space they needed to mount an attack. Michy Batshuayi gave Naldo the slip inside the Schalke area on 80 minutes but was unable to steer his header the right side of the post. It was the closest Dortmund had come to any sort of equaliser – it was to be a telling miss. Moments later Naldo had his seventh goal of the season and Schalke’s second – it was spectacular. The Brazilian unleashed the most powerful of free-kicks to leave Bürki no chance. It was an unstoppable rocket that nestled in the bottom corner of the Dortmund net, Schalke had deservedly beaten Dortmund for the first time since 2014. The Ukrainian powered the hosts forward from the opening minutes, frightening the Dortmund back-line every time he broke forward. Unlucky not to have broken the deadlock on the stroke of half-time he was rewarded in the 50th minute. His rasping shot left Bürki no chance, he had found the crucial opening goal. Dortmund’s defensive frailties once again reared their ugly head. Schalke’s opening goal a catalogue of errors – individual and combined. Schmelzer gave the ball away whilst the entire midfield opted to leave Konoplyanka all the time and space required to set the hosts on their way to victory.